This is from the US 5th Fleet CMF web site and show the international nature of the anti piracy forces very well. For the past three months the Turkish Navy was at the helm of Combined Task Force 151 (CTF-151), the multi-national counter-piracy mission of Combined Maritime Forces (CMF). A small but dedicated team of international naval personnel was embarked aboard the flagship TCG Gaziantep to join task force commander Rear Admiral Sinan Ertugrul and his command staff, the majority of whom were drawn from the Turkish Navy, with the more senior officers having attended the prestigious naval college in Istanbul. RADM Ertugrul said “I was proud to lead an international staff, at the head of an international task force, patrolling international waters. CTF-151 is effective as a force for good in the region precisely because of our mutual understanding, cooperation and shared commitment to tackling the serious problem of piracy. Click here for the whole text. First and foremost Turkish Navy is offering protection and comfort to the Turkish ships and crews passing through the regions. Turkish Navy is gaining know-how on commanding multinational staffed task forces that operate away from the home waters in. Turkish Navy is fulfilling its share in international naval operations thus showing other nations that it is a serious partner in such cases and developing bilateral cooperation. This is the kind of story that makes me sentimental and warm in side. On Monday Turkish frigate TCG Gaziantep rendezvoused with Turkish solo ocean rower Erden Eruç of the coast of Madagascar. He is committed to his human powered journey around the globe. Mr. Eruç left Australia 110 days ago and was alone since then. The sailors of the frigate were the first people he has seen for a while. 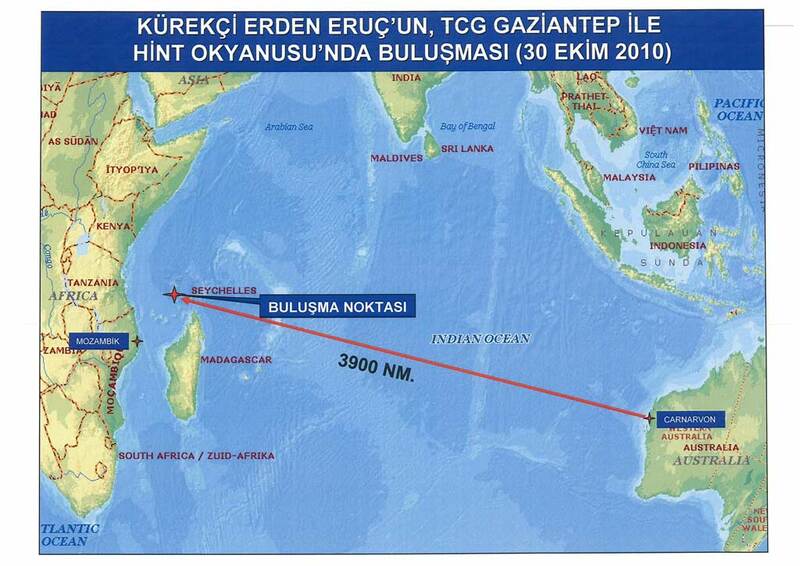 As he was entering the part of the Indian Ocean with high piracy activities, the commander of CTF-151 Rear Admiral Sinan Ertuğrul was personally tracking the progress of Mr. Erden Eruç and exchanging e-mails with him. Today was the day of rendezvous with the Turkish frigate TCG GAZiANTEP. On board was Rear Admiral Sinan Ertugrul, the present Commander of the Combined Task Force (CCTF) assembled to counter Somali piracy in the area. Observing that my pace had increased considerably, doubled in fact on account of the strong currents under me, he had moved up this rendezvous at sea by a week. He had been kind to write to me personal emails to inform me of piracy activities and security measures. After considering a few options and running them by our team, a joint decision was made on where to attempt my landing while avoiding problem areas. Now en route to my destination, the CCTF was coming to honor this crossing, to be present on this joyous occasion. He was on a frigate named after my mother’s hometown. My mother was born in Kilis near the Syrian border and grew up in Gaziantep. My father met her there. Much of her relatives still live in that area. This was indeed to be a special day. The helicopter ran circles around me, they were taking pictures from above, making me giggle uncontrollably, laugh and hoot and holler. This was turning into a party already! Reading, stories such as this or this, when a foreign navy escorted and protected a lone compatriot in the vastness of the oceans, made me jealous. I see such gestures as a sign of seamanship. Such gestures a are a bold and loud announcement that, your navy never lets you down, or helps you where ever you are. Turkish Navy did not used to make such statements very often or publicly. It is good to see that this is changing. I find it personally touching that Rear Admiral Sinan Ertuğrul takes time to personally communicate with a lone ocean rower. I think that this meeting was a moral booster for all participants. Mr. Eruç knows that even in the dangerous and pirate infected waters of remote Indian Ocean there is a Turkish frigate he can count on if he needs. And the crew of TCG Gaziantep knows that their seemingly endless cruising on the vast oceans is not for nothing and their presence do mean a lot to many really. Click here to learn more about Mr. Eruç’s adventure.